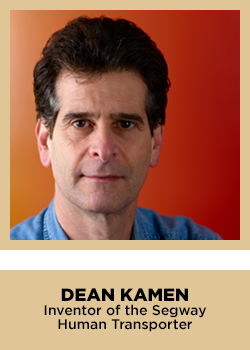 Dean Kamen is an American entrepreneur, inventor, and tireless advocate for science and technology. His inventions include the revolutionary Segway personal transportation system and IBOT, a uniquely designed powered wheelchair that "walks" over curbs and stairs. At the age of 30, Dean sold his first company and in 1982 founded DEKA Research & Development Corp. His roles as inventor and advocate are intertwined with his own passion to focus on medical innovations aimed at improving lives around the world. In 1989 he founded FIRST (For Inspiration and Recognition of Science and Technology), an organization dedicated to motivating young people to understand, use, and enjoy science and technology. In Dean’s session, you will hear about his push for big ideas, his cool gizmos, and his quest for the next generation of miracles. 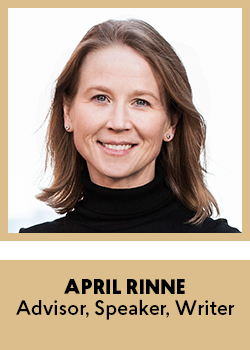 April Rinne is equal parts global authority, advocate, ally, and adventurer. She sees trends early, understands their potential, and helps others do the same. She’s a global citizen who brings insights, access, and perspective to companies, governments, investors, and organizations worldwide. But April is not only a thought leader; she’s also a doer. She connects people, ideas, and resources in ways that say "wow, that's what the world needs"—and then makes it happen. April is a pathfinder within the new economy (encompassing the digital, sharing, collaborative, freelance, gig, on-demand, and platform economies). She advises startups and established companies, local and national governments, policy makers, think tanks and investors, working across for‐profit and nonprofit models. Her areas of expertise include policy reform, global expansion, the future of work, travel and tourism, sustainable development, cities, and emerging markets. She is known for her skill in bridging the private, public, and social sectors; seeing shifts and opportunities before they go mainstream; and having a keen eye toward responsible, inclusive business. 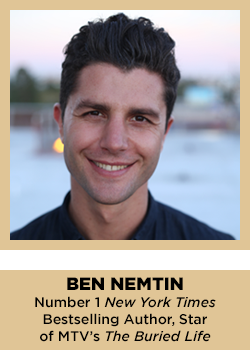 Number 1 New York Times bestselling author and star of MTV's The Buried Life Ben Nemtin's story begins 10 years ago. Fed up with the monotony of day-to-day life in college, Ben and his friends set out on a two-week road trip with a camera and a borrowed RV to complete a list of "100 things to do before you die." For each item they accomplished on their list, they helped a complete stranger cross something off their own list. Since then, Ben and his friends have crossed off nearly all 100 list items and have encouraged millions to believe that anyone can do anything. Ben's bucket-list quest has brought him from the White House to play basketball with President Obama (number 95) to Oprah's couch (number 61) to having a beer with Prince Harry in London (number 82). Currently, Ben is crossing off number 91—make a movie: The Buried Life feature documentary film is set to release in 2018.